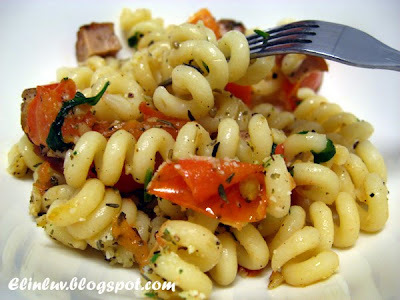 Using the left overs of tomato roma, italian parsley in the fridge ,I whipped up Riccioli Aglio Olio in just an hour ...using the same aglio olio recipe but this time, I added black pepper sausage bits and dried mixed herbs and garnish with parmesan cheese. 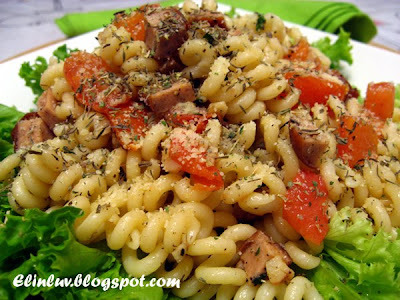 Wow..such a simple pasta dish and yet so tasty and flavorful. Piggy Cuz came visiting this afternoon and brought gifts for us from her recent trip to UK and guess what, she gave me a bottle of dried mixed herbs all the way from UK. And knowing this Momsie, the mind starts to plan what to cook for dinner and her bottle of mixed herbs came to mind. The aroma of the mixed herbs - thyme, sage, parsley, marjoram and oregano in my pasta really make my senses go haywire.... it gives oomph to the Riccioli Aglio Olio I cooked! does this look good to you LOL! mouthwatering...yes??? I have already used it for the pasta ! LOL! Gently saute all the ingredients A in a non stick pan till fragrant. Add sea salt to taste and off the heat and toss the cooked riccioli with the saute ingredients and the black pepper sausage bits till well mixed. 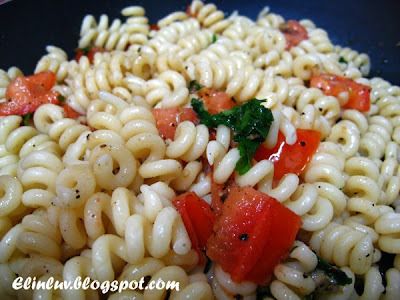 Dish up and shake the mixed herbs generously on the pasta and garnish with parmesan cheese. Served immediately.
" I detest...anything over-cooked, over herbed, over sauced, over elaborate. Nothing can go very far wrong at table as long as there is honest bread, butter, olive oil, a generous spirit, lively appetites and attention to what we are eating ." 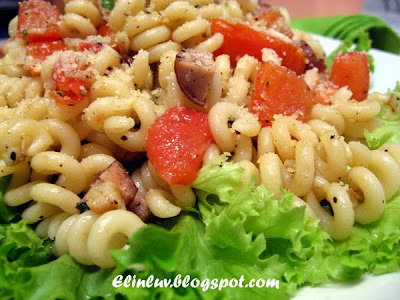 What an easy, delicious-looking pasta meal! The fresh tomatoes and sausage sound so good together. Elin, that's forbidden good looking pasta dish, the one with lots herbs atop is my favourite. Thank you so much for the great inspiration on my site!! Really very yummy-looking!!! I especially like the quote at teh end of your post - it is so true. Wonderful dish and so healthy too! @ The Little Teochew : Hi hi...I love the quote too...glad you like it too. Haha I have to balance my diet...sinfully rich ones to the simple and healthy one LOL! Wonderful article on food with herbs.I found this website useful for Herb Gardening tips http://www.herbgardeningtoday.com. 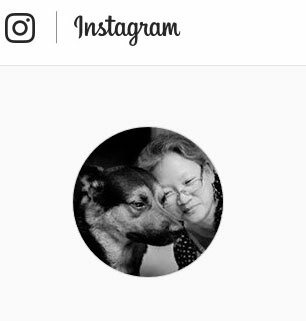 I think you guys will find it interesting too.